The NABP 115th Annual Meeting, “Working Together as a Team Makes Anything Possible,” provides pharmacy board members and staff as well as other pharmacy stakeholders with an opportunity to take an active role in protecting the public health. 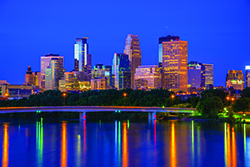 Held at the Minneapolis Marriott City Center, the gathering serves as the venue for boards of pharmacy to elect officers and members of the NABP Executive Committee, to review and vote on NABP policies via proposed resolutions, and to guide the direction of the Association. In addition to the important business sessions, attendees have the opportunity to participate in networking opportunities including the President’s Welcome Reception, the Hospitality Brunch, and the Annual Awards Luncheon. The 115th Annual Meeting features a new, streamlined schedule. This three-day meeting format was developed to better serve our members’ needs and requests. The Annual Meeting offers timely and informative continuing pharmacy education (CPE) activities led by educators, regulators, and others who will share their insights, knowledge, and experience of the practice of pharmacy. Learning objectives and descriptions for this year’s CPE activities are available on the CPE Programming page.